She's Fantastic: Aliens LT. RIPLEY! I've had this figure of Ripley for quite a while and never really gave much thought about reviewing her. It's not that this isn't a great little figure, but it always seemed a little generic, brightly colored, and too unlike Sigourney Weaver to warrant much attention. This toy line from Kenner came out six years after the film's release and coincided with the release of Aliens 3 (which didn't get much love from the plastic world... or the film critics). Anyway, like I said, I never really gave this figure much thought until a reader of this blog pointed out the similarities between this figure and the Karen Ross figure from Kenner's 1995 Congo line that I reviewed last week. I'm a sucker for interesting little tidbits like that so I immediately began researching shared Kenner moulds. I've been aware of the Robin Hood / Star Wars parallels for a long time, and I was really excited to think I might have found my own (Thanks to Artistix!). Interestingly, these figures share almost no identical parts, but I am just as intrigued by the level of minor retooling that I guarantee no one would have cared about. Let's check out the Ripley figure (and clone) below. Ripley came with a two-piece flamethrower gun. It fits together pretty simply. She also came with a sticker sheet of decals for her shirt and gun, as well as a comic from Dark Horse Comics. Additionally she had a more standard issue rifle, but I unfortunately don't have that accessory. you can see it in the packaged pics at the top. The flamethrower has a simple slide-feature where the pink peg (that fits into her yellow hip-sack) can move the translucent flame in and out of the gun. Okay, time to compare her to Karen Ross. You'll notice that the only identical piece is the crotch. The rest all has retooling which is pretty minor, but at the same time time pretty noticeable. Even the arms have added wrinkles on the tiny sleeves for Karen. Plus the boots have an added tier up her calf. It seems like Kenner really had a budget to justify. Also, it seems like these figures also share a lot of similarities with Ellie Sattler from the Jurassic Park line. Oh wow, they are actually quite different! It's interesting seeing the figures & weapons side by side. 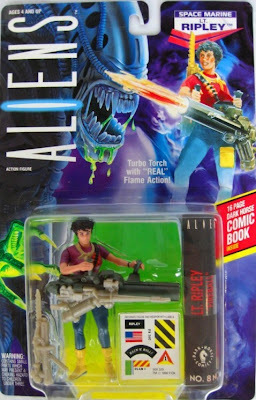 Bizarrely, I put all of those stickers on Ripley's flamethrower...& didn't even think of putting them on the figure herself! haha. Looks good. Looking forward to my Karen Ross arriving soon too. I'm glad the outfit is heavily modified, so she won't look too much like Ripley. 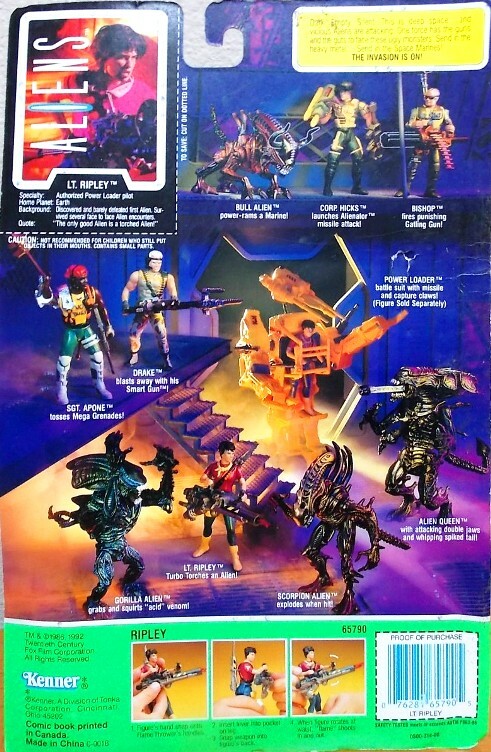 I would have been 11 years old when the Aliens figures hit shelves. One of the first toylines I collected. Actually I bought my Ripley second hand in a collectibles shop and all her stickers were already applied. I just assumed there were directions included on exactly where to place them (a'la GI Joe vehicles). I figured you would appreciate the retooling :) Karen really does look like a missing Aliens character. 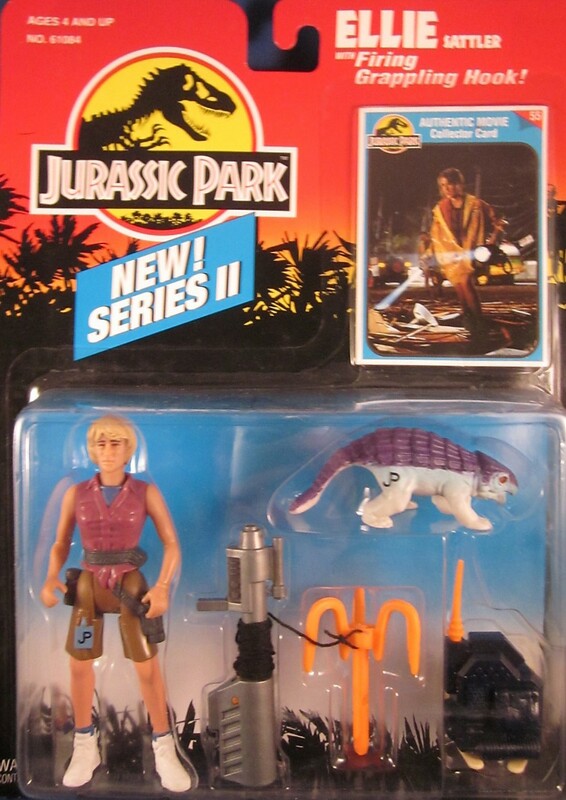 That Jurassic Park figure shares the same posture and weapon style as well. When Avatar came out, I thought it would be fun to collect all the Sigourney Weaver figures (Aliens, Ghostbusters, Avatar, etc), but when I saw the Resurrection Ripley I decided to scratch that idea.. haha.